AudioWeb by MollieSoft - Play your audio files from any web browser! Download and manage your podcasts automatically. Check out the 60-day free trial! Current Version: 1.4.1.0, released December 26, 2018. New! Episode search helps you find episodes by text, dates or sizes! Download episodes manually or on a time schedule. 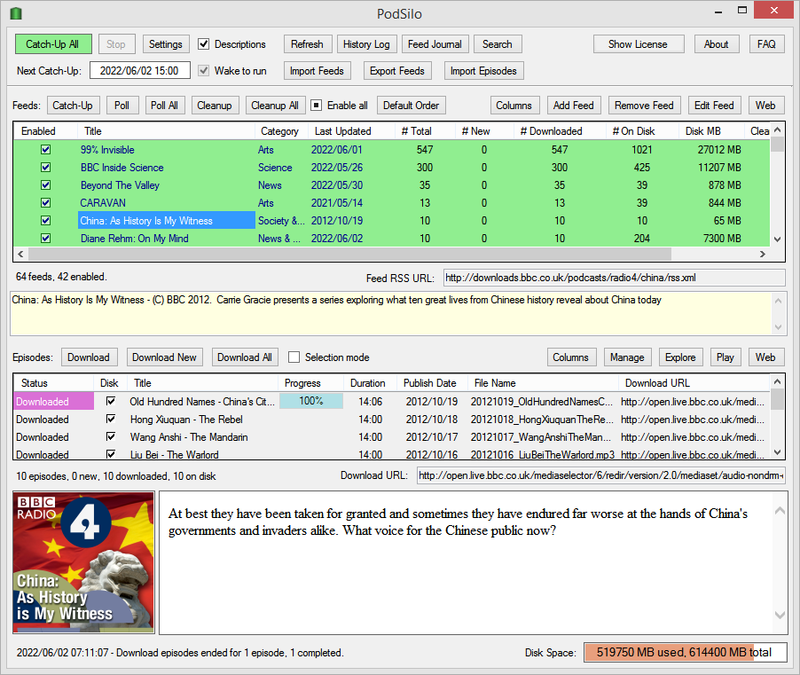 Episodes can be saved on a USB drive or network shared folder. Search episodes in all feeds by text, dates or sizes; use logical expressions to combine search conditions. Manages disk space used by the downloaded episodes. Episode cleanup rules determine which episodes are kept during catch-up, and how much disk space is available for each feed (or for all feeds). PodSilo is efficient and performs well even with thousands of feeds! Try PodSilo free for 60 days! BitCopy by MollieSoft - a File Copy utility for Windows. 1.4.1.0 - The download folder for feeds can now be on a removable USB drive or writable network share. 1.3.7.0 - Improved performance of feeds and episodes lists. Allow a catch-up schedule to repeat periodically after the start time, within any scheduled day. New "Show All" button in Search View. Include "hidden" episodes in search results. 1.3.6.0 - Fix: Parse length = "None" as "0" on some rss feed media enclosures (fixes rss of NPR feeds Radiolab, Snap Judgement, Money Talking). 1.3.5.0 - Recognize any early config file (version < 1.2.13.0). 1.3.4.0 - Increased timeout limit for episode downloads from 10 minutes to 1 hour. 1.3.3.0 - Message box fixes. 1.3.2.0 - Make font bigger/smaller using Control-NumPlus, Control-NumMinus. Add user notes to episodes. Organize feeds by categories. Feed sort order is persistent (by title, enabled, or category). 1.3.1.0 - Search episodes in all feeds by text, dates or sizes; use logical expressions to combine search conditions. 1.2.15.0 - Explicitly mark episodes as "downloaded" in the Manage Episodes dialog. 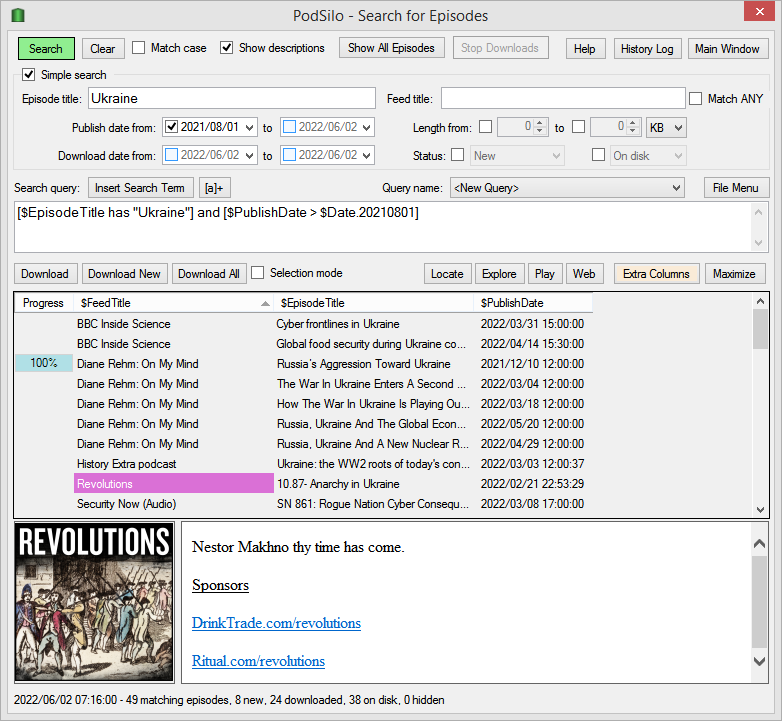 1.2.14.0 - Can now import episodes into PodSilo from a different podcast downloader program; allow subfolders for feed folders; accept TLS 1.2 feeds. 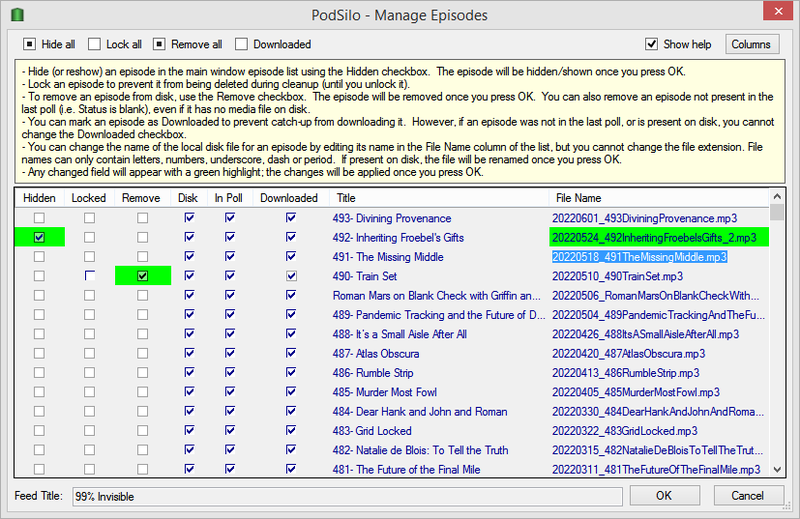 1.2.13.0 - Various improvements for PodSilo.cfg and Feed.cfg: write temp files first, write EOF marker at end. 1.2.12.0 -If a media file exists, it is always considered "downloaded", regardless of its provenance. More robust file I/O for config file PodSilo.cfg. Better handling for moving directories when renaming the download directory in Settings dialog. 1.2.11.0 - If a feed has video items, episodes list now shows Media type column; use control-v to paste a feed url directly into the feeds list. 1.2.10.0 - PodSilo now runs on (most) Windows 7 systems; handle some video feeds in addition to audio feeds; scroll to matching title entry as user types, in episode list or feed list. 1.2.8.0 - Fix: parse feed date-times correctly for machines with non-English locale. 1.2.6.0 - Workaround for some graphics cards that do not support the splash screen opacity settings. 1.2.5.0 - Can now successfully poll feeds containing url-encoded self-referenced atom links (attribute rel="self"). 1.2.4.0 - Hide, remove or rename episodes via the new Manage Episodes dialog. 1.2.3.0 - Added an initial splash screen. 1.2.2.0 - Fix: running out of total space always terminates catch-up or download commands. 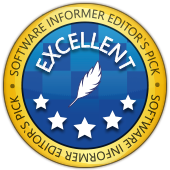 PrLog.org - MollieSoft Announces the Release of PodSilo 1.3.1.0. PodSilo © 2017-2019 by Marvin Hymowech.